(S) Men's vintage 1960s-70s Duster Jacket! 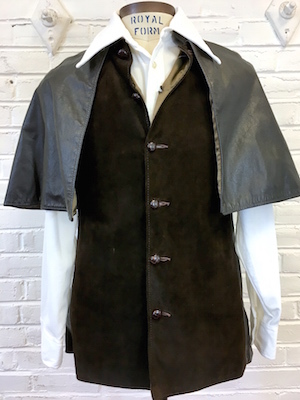 Brown Suede Vest w/ Leather Cape! Home > Items just added 4/3-4/17 > (S) Men's vintage 1960s-70s Duster Jacket! 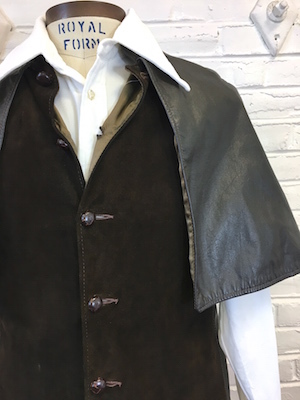 Brown Suede Vest w/ Leather Cape! Vintage 1960s-70s men's leather and suede duster! Or cape! Or vest with cape! Or vest with duster! Or... Yes, tough to describe, but absolutely wonderful! 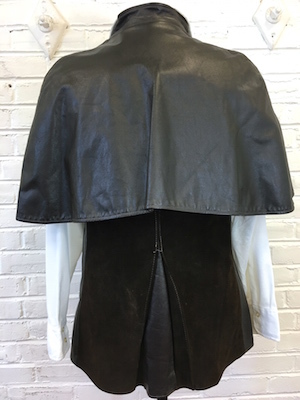 The vest is dark brown suede while the cape is smooth, dark brown leather. The body buttons with 6 leather covered buttons, so it will fit snug against your body. The cape part is attached at the collar and falls over the shoulders (like on a western duster). In the back at the bottom center is a large inverted V that has the smooth leather in between the suede of the body. Really, really amazing piece. Made by Buckboard Original Designs in Leather Goods. I've taken a bunch of photos so hopefully that'll help. Condition: Very Good, very clean, no rips.